The comfortable is one of our most popular knee scooter for people of many sizes and heights. 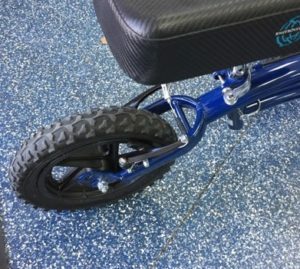 The large all-terrain tires and tie rod make this one of the safest, most stable, and comfortable knee scooters for rent in Denver. The All-Terrain can handle up to 350-lbs, making it an excellent choice for people who are more abundant in height or weight. It has one large wheel in the rear, making it great for riding outside in the snow. But if you’re concerned about stability, you may want to consider the Zuma Outback, which offers two plastic wheels. 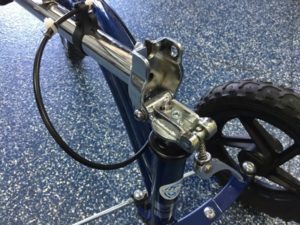 Back wheel on the Blue All-Terrain Knee Scooter. CLICK to enlarge. The All-Terrain knee scooter has terrific pump-up pneumatic tires with treads. It also has a tie rod, which keeps your wheels rolling straight when you hit any bumps. These features make this one of the most mobile scooters in existence. 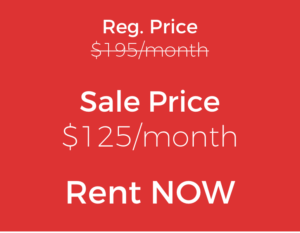 It’s large enough to give you a lot of support, without being the bulkiest option on the market. 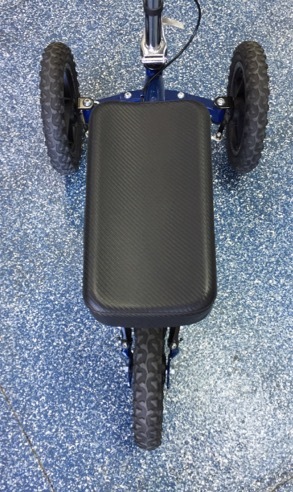 The front basket is large and convenient on the All-Terrain knee scooter. CLICK HERE to see the larger image. One of the most significant challenges you’ll find when you lose mobility through your legs is: How do I carry my stuff? We’re so used to just holding bags, papers, bags, and books in our hands as we cruise around the office or on campus. 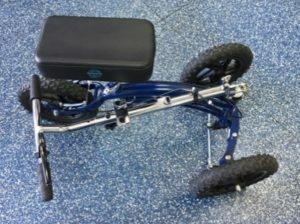 The All-Terrain knee scooter provides you with a large basket for efficiently carrying around anything you would typically hold in your hands. Comfortable seat on the All-Terrain Knee Scooter. CLICK to enlarge. This seat has excellent padding for a comfortable ride. If your leg or foot is healing, you don’t want your knee banging around over rough-terrain. If you’re concerned about the comfort, you may want to choose this option. You can also add extra padding for additional support. The seat can adjust quickly, to find the just the right height. This All-Terrain model of Knee Scooter is not the most compact option. But it does fold, helping it to fit into most trunks of cars. The knee scooter folds for easy transport. SEE larger image here. Compacted Blue All-Terrain Knee Scooter after folding. CLICK to enlarge. Rent the All-Terrain in Denver Today! 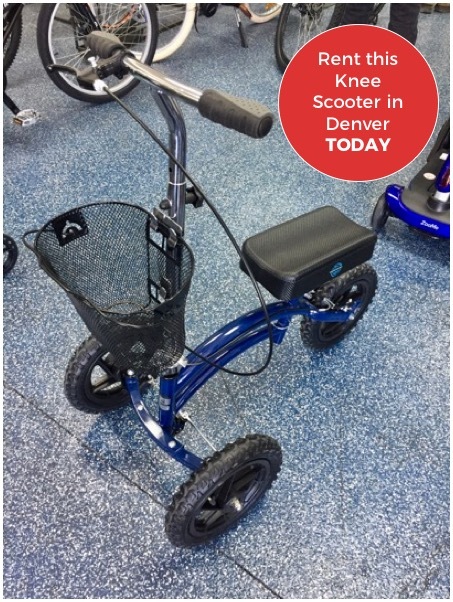 Give us a call and see if we have this amazingly comfortable and versatile knee scooter in stock here in Denver, Colorado. 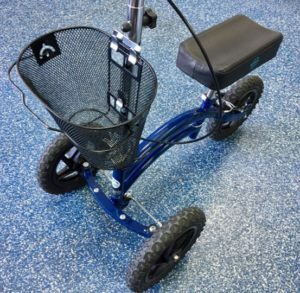 The Blue-All Terrain is one of the best possible knee scooters you can rent.